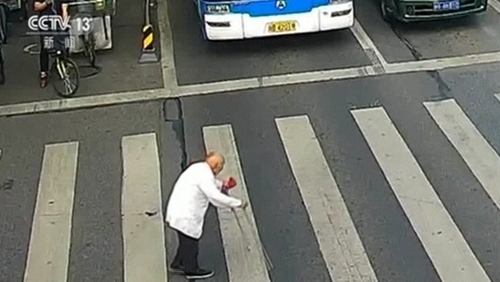 TV footage from China shows a policeman helping an elderly man crossing a very busy road. The man, who had two walking sticks, was shuffling across a road with six lanes in Mianyang city. He was halfway across the busy intersection when the traffic lights turned green, but none of the vehicles moved, waiting for the elderly man to cross. A policeman then approached the man, and spoke to him briefly before carrying him safely across the road, according to Chinese state TV CCTV.